Why hello August! I know, month after month I moan about how fast the year is going but as much as I hate how fast it is whizzing by BUT I’m not going to do that this month… I’m actually excited for September. This months favourites were pretty easy to write up, but at the same time they did feel like a bit of a challenge. I hope you enjoy them either way, I always love writing my monthly favourites, so I hope you always enjoy reading them. The Body Shop Body Yogurt in Banana. I recently posted a wish list Wednesday about The Body Shop and the majority of that wish list had the new limited edition banana range on it. Literally 3 days later I was in a store buying all of the goodies I had posted on that wish list. Since I picked up the body yogurt I have been using it daily and oh my, it has changed up my daily routine! My skin has been looking and feeling dry lately and I HATE moisturising. Not only do I find it a chore, but thick creams can leave me feeling clammy and warm so I avoid it like the plague. I’ve heard nothing but good things about the yogurts and it was Estelle’s The Body Shop haul post (which you can read here) where she spoke about the strawberry one that got me into giving it a go. Thanks Estelle! 😛 This has just been a game changer for my skin. It really is lightweight and only takes 5 minutes max to apply all over and thankfully doesn’t take long to dry so you can be dressed quickly. I plan to have a review of this up on my blog ASAP, possibly this time next week so keep your eyes peeled for that! Korres Wild Rose Lip Butter. The Body Shop Body Butter in Banana. Yes, another one of the banana products from The Body Shop and this one I have fallen head over heels in love with, for many reasons. There is one product I dislike from The Body Shop and that’s their body butters. They’re really thick, and don’t last very long for how much you spend on them! I’ve tried at least 3 different ones over the years and each one has left me feeling sticky and hot both in the colder and hotter months. However, the banana one smelt amazing so I KNEW I had to pick it up. But I decided to pick up the little tub so that I could test what I thought of the body butter as a hand butter instead. Well, so far I am LOVING IT! It makes such an amazing and deeply nourishing hand butter and I do love it. Whenever I use it at work I get nothing but compliments on the scent, which in turn makes me happy. I’ll definitely invest in the bigger tub soon and just keep the little tub to decant the product into. I’ll also definitely give other scents a try in future, including strawberry. Clean & Clear Blackhead Clearing Cleanser. This is another product I’ve mentioned recently on my blog (you can read that post here) and since I picked it up at the start of July I have loved using it on my skin! I was after a new toner and for years my mom has been using this one and always praised it up. My skin has been in atrocious condition for the longest time now, which was down to certain products I was using, including the old cleanser I was using. This one has helped clear my skin so much and for under £3.00 I am so CHUFFED to have finally discovered it. 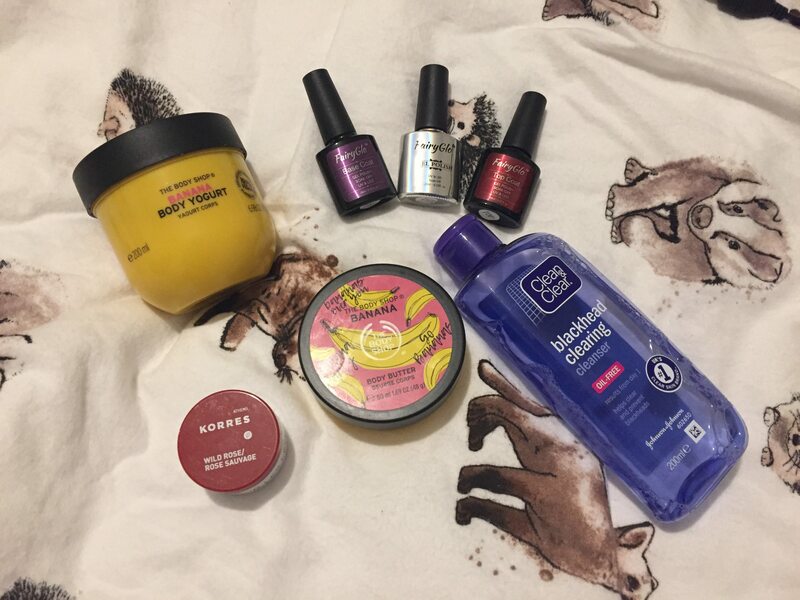 So now my beauty favourites are done, time to talk about the miscellaneous favourites of the month! Favourite TV Show – Two Pints of Lager and a Packet of Crisps. This is such a random one TV show to start watching, but recently BBC put it onto iPlayer so I’ve just been binge watching it pretty much. I used to LOVE Two Pints growing up and as a student, I just felt like I could relate to it, even with the humour and such. It also just reminds me of when I was younger too with the themes and the fact it’s set back when I was younger. I’m currently on season 5 and close to finishing it. If like me you loved Two Pints growing up, then honestly give yourself a blast to the past and watch the whole box set on iPlayer whilst it’s on there. Favourite Film – Inglorious Basterds. Favourite Book – A Polar Bear In Love Vol 3. Yay finally Vol.3 came out in July and I was so excited to read it after how they left off in Vol.2! I honestly love A Polar Bear In Love, as it is such an adorable manga and one that I will enjoy reading until it finishes. I FINALLY found a gif to use on my blog for posts like this one! They also have short anime clips out of parts from the manga, which is equally adorable, if not cuter. 😛 If you love cute manga, I cannot recommend this enough! Favourite Song/Album – Daft Punk Random Access Memories. Recently at work we were talking about music and one of the questions that went around the office was, “What band would you like to see before you die?” and my answer was Daft Punk. I have LOVED this band for as long as I can remember and they are a massive part of my life. They’re the reason for my love of a lot of music and are for sure a band I would love to see perform. This is the last album they released (I pray they’ll bring out another soon!) back in 2013 and it came out not long before I met Dane. This album reminds me of that year and how rough it was. I listened to it when things were hard because it always made me feel better. I even wrote a MASSIVE review on it back in the day, which I’ll link here. I’ve been listening to this album quite a lot since then and ARGH I just forgot how much I love it and how I need more Daft Punk albums on my iPod for my car. I’ve added a couple of my favourite songs from the album above. So those were my favourites from July! I feel like they weren’t anything special but to be honest with you I feel like July went by in a ball of madness! It’s been a pretty decent month to be honest in every single way. As I said at the start of the post me and Dane both had some great news, we’ve had some amazing sunny weather and some much needed rain. It’s overall been a pretty decent month and I’m excited for what August brings! What were your favourites from July? Make sure to let me know in the comments down below. Until next time, take care all and I hope you’re having a great week so far. Nat, 29, beauty, fashion and lifestyle blogger, and geek of the otaku persuasion. I love anime, manga, matcha flavoured Kit Kats, coffee, puppies, Pokemon, South Park, playing Persona 5 and so much more! Items with * next to them have been sent or gifted for reviewing purposes.